Things in Eden are heating up as Mayor Shriffron gears up for war against Isaac and his faction. This is the calm before the storm as final preparations take place. Meanwhile, Mark sees a future with Maggie but will this battle change their future? 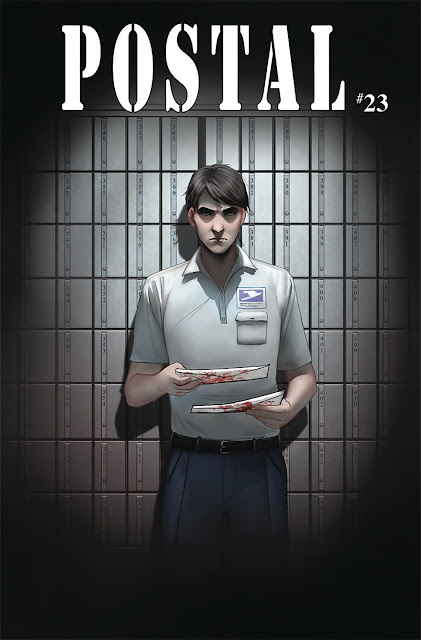 'Postal' #23 reveals a side of Mark we haven't seen before. Mark has been very literal and logical but his relationship with Maggie has inspired him to see beyond his lot in Eden. He envisions a life with her, a child, and as far away from Eden as possible. It reveals a growing desire to finally break away from his mother's influence and the town that is too contentious to be sustainable and Mark sees that. Especially with a war brewing, Mark is seeking a happier future. Unfortunately, it could be all be foreshadowing a devastating reversal of fortune. Meanwhile, Agent Bremble confirms his commitment to Isaac for one final mission, to destroy Eden and bring Laura and others to justice. He's not the most stable person as one who aligns himself with a cult leader would be. He made his pact with the devil to attack their mutual enemy but he's basically a man without a country right now. Even when there isn't a lot of action, especially when 'Postal' takes on a more cerebral approach involving strategy and nuance, artist Isaac Goodhart lays out an engaging comic with the eye of a cinematographer. His varied use of perspective from Laura, Mark, and Bremble present a sweeping picture of intimacy at times and thoughtful contemplation at others. There are some parallels that take place between all of the players. Bremble and Eva, Mark and Maggie, Laura and Magnum, provide the exposition revealing their thoughts and concerns to one another and what it means for each of their relationships. Goodhart makes these seemingly mundane conversations engaging. 'Postal' continues to be one of the best crime dramas in comics. It's as good as any TV show you find on cable. No wonder Hulu is adapting it. Few comics are created with such care and with such respect for its audience. It's smart and serious so it doesn't talk down to its readers but instead envelopes them in a tense and dangerous battle of wills. 'Postal' is still pull list-worthy.